AshleyNewell.me: Peanut Butter Jelly TIME! Hi friends! I'm back again with another post today. I've decided to go ahead and post this so I don't forget. I am always so sad when I make a challenge card and forget to post. 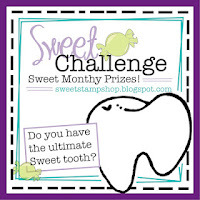 This challenge ends this Sunday and weekends always get a little bit busier for us so I wanted to make sure to post. Tomorrow, Brady has his spring party as school. I have yet to decided if I have enough energy in me to make goodies for the kids. Hmm... Then on Saturday and Sunday, we have birthday parties for a couple of our favorite people. If you don't hear from me, you'll know why! 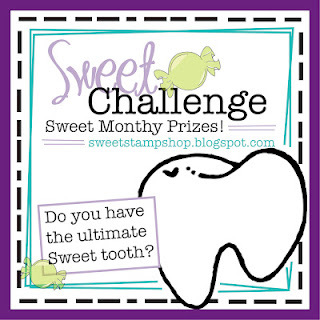 Here's another card I made for the Sweet Stamp Shop March Challenge. 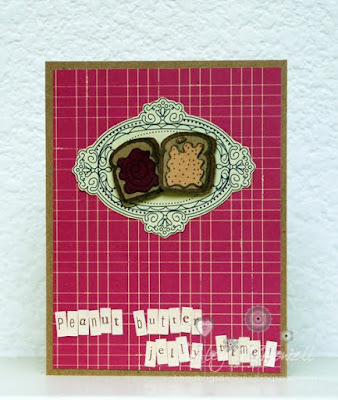 This card is dedicated to my son Parker who eats peanut buyer sandwiches at least once a day. He's extremely fickle and I don't care WHAT anyone says, he will go hungry if it's all food he doesn't want to eat. I've watched him literally eat two bites of food a day for several days in a row. I'm done fighting it. If he wants PBJ everyday, than so be it! So, basically that makes this an EVERYDAY card at our house. ;) Obviously, Sweet Stamp Shop's Perfect Match stamp set is a perfect match for me. The paper is American Crafts Amy Tangerine. The letters are from Making Memories. Now, you have to go look HERE to see a card my friend Savannah's card with this same set. She actually made the card for the card for me! :D She wouldn't let me see it until she posted it on the blog either.